While Roaming on the freeway, a Tesla Model X got struck by a steel shaft that came out of nowhere, says the owner — Autopilot (Tesla’s semi-autonomous driver assistance software) took over until the driver came back from the mental shock and was able to drive (high-res photo below). San (@vicentes) along with the family owns a 2016 Tesla Model X (affected vehicle) and a Tesla Model 3 as well — surely a family that cares about a sustainable future. San thanked the safety of his family to Elon Musk and Tesla for building such strong and safe vehicles that the owners can trust. 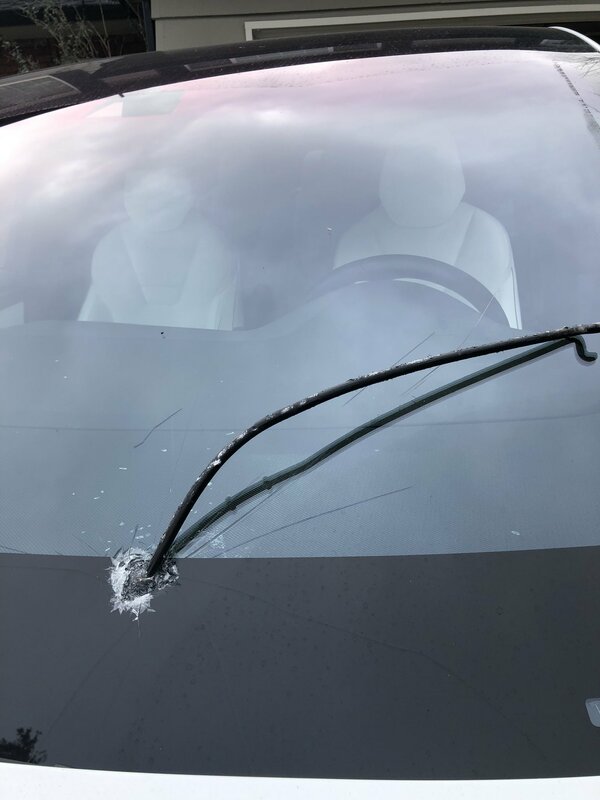 This is a kind of accident that is unimaginable by a driver in normal conditions, looking at the steel rod (high-res photo below) raises many questions about the origin and cause of this incident, a thin possibility of a Tesla hater cannot be excluded. Btw @elonmusk, my family thanks you and @Tesla team as a steel bar flew into my wife’s Model X on the freeway, AP kept everything under control as she recovered, Model X super strong glass took the hit & grabbed the bar. Safest car on the road. Main update is that the rod is likely a car hood prop that was on the road from some prior accident. It was probably kicked up at high speed by a car in front of ours. Looking at the picture we see that the steel bar’s rear-end penetrated the Model X’s windshield glass and seized there, because of being captured it wasn’t able to bounce more and cause further damage. We have recently seen Tesla Model X getting involved in weird accidents like a small plane crashing onto it along with some other vehicles, still, no fatalities, that’s Tesla safety par excellence. Tesla’s entire vehicle lineup i.e. Tesla Model S, Model X, and Model 3 earned a 5-star safety rating in every category in NHTSA crash tests, to the point where Model 3 achieved the lowest probability of injury of any vehicle ever tested by the NHTSA. Not really. Will be replaced on my driveway Wednesday. Next-Generation of Tesla glass is the ‘Tesla Armor Glass’ claimed by Elon Musk to withstand even a thermonuclear explosion (otherwise money back) — the closest Tesla Armor Glass application will be seen on the Tesla Semi Trucks expected to go into production in 2020. Owners and enthusiasts are demanding Tesla Armor Glass on Model S/3/X but definitely, this will increase the Tesla vehicle prices — an optional on-demand application should be the solution at high prices for owners willing to pay a premium.